In 1978 I graduated from college. As a reward, my parents offered to help me buy a car. In fact, they had a suitable car already picked out for me—a Ford Pinto station wagon with low miles, waiting at a dealership north of Indianapolis. They would pay the down payment and I would handle the monthly payments of $90 until the car was paid off—a matter of some two years, to cover its $2400 purchase price plus interest. We went to look at it—and I recoiled in horror. Low-slung and ovoid, it looked like a Bic lighter on wheels. From the moment I first saw it, I had visions of myself trying to maneuver bags of groceries and a toddler into and out of its cramped back seat. Becoming a suburban mom with toddlers and groceries was not in my plan. Rather, I intended to move to Madison, Wisconsin, a destination I had picked for its reputation as a hip college town. That car and I were pulling in two different directions. The price was right and I accepted it, but I never learned to like it even a little bit. Approaching it in a parking lot, I would see that spirit of a suburban mom, hear the ghost-whine of her toddler, feel her spectral exasperation with that vile car. After a short time in Madison, I realized I would need more training to compete for the jobs I wanted. I enrolled in a local technical school’s commercial art program and took a part time job. I told my parents I intended to sell the Pinto—I couldn’t afford the payments while in school. They encouraged me to return the car to them rather than sell. They offered me $600 for it, and I agreed. I drove it back to Indianapolis and returned to Madison on the Greyhound bus. Two years later I finished my commercial art course, got a job I loved at the Isthmus newspaper, and met the man for me. We announced our plans to marry. “A car!” I replied. I had no interest in a fancy wedding, and I had just spent two years riding the bus. In June of 1983 Jim and I were married by a Justice of the Peace, and celebrated with a reception in Orton Park. 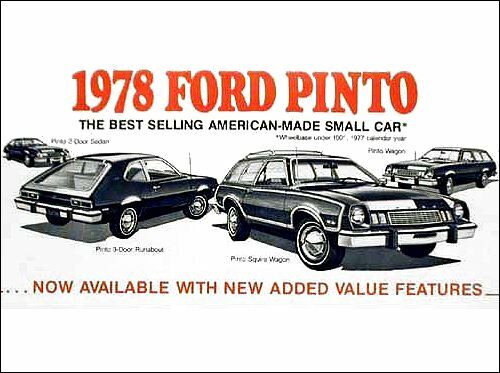 My parents arrived from Indianapolis in two cars—one driving their blue Chevy and the other my new car—that damn Pinto wagon! I would never have agreed to the “wedding car” if I had known that was their plan. But what could I say? “Thank you” would have to do. As I mentioned at the beginning, I ask, “with whom do you sympathize? From whose point of view do you see this story?” Some people see me as a most ungrateful girl. Others say my parents just didn’t “get” me. It’s a reminder that however you see your story, others–including those in it–will see it through the lens of their own values and life experience. This story comes to mind because my mother is planning to move to a senior community in Madison soon. She says, “I’ll buy you a new car.” (She doesn’t find my Jetta comfortable or easy to get in and out of.) “That way I can make you take me places.” ) I wonder what new parental car story I will be gifted with…. Here is why I sympathized with you in your Pinto story. In 1989 my husband found a used Mercedes diesel station wagon for sale and convinced me that it would be a good car for me to drive on the California freeways–safe and solid. I had buyer’s remorse almost immediately. I resented the bother of looking for a station that sold diesel, and I hated pumping that smelly oily fuel into it, even though it did get good mileage. Mostly, I just didn’t see myself as a Mercedes type of driver. Too showy and too foreign. I was brought up in a lace-curtain Irish neighborhood in the Bronx, where people drove Fords and Chevies, not high-end German cars. I would be seen as putting on airs if I showed up there behind the wheel of a Mercedes-Benz. But the wagon was bought and paid for so I drove it—for more than thirty years and over 300,000 miles. We’ve lived in the same town all those years and I’ve come to be associated with my car. When my friends see the old burgundy MB in the parking lot, they know they’ll find me in the stacks. We still own the car, and though I no longer drive due to health problems, I’m having a hard time parting with it today. Funny thing is, my grandkids are angling to take it over whenever I’m ready to let it go.